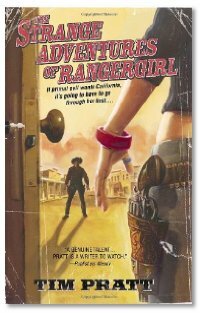 We talk with Tim Pratt about his book The Strange Adventures of Rangergirl. If you like tales that step away from the norm, then this is the book for you. - We remind you that the Call for Graphics is coming to a close. Juice tried to download this episode twice, anybody else experiencing problems with the feed? Must just be you dude. Everything here is clicking along fine. I really enjoyed listening to the interview. The short story is a lot of fun to read, so go check it out! Evo: Checked on "contemplative" and, according to three different on-line dictionaries (including the Merriam-Webster), both pronunciations are valid. Get Sean McMullen on. I have not read any of this new series you have talked about, but his Greatwinter saga is execellent. A definite addition to my To Be Read List. Santa Cruz is the home of the Banana Slugs, you know. So I'm perusing my local B&N and what do my little eyes see. A shiney new book, just for me. The Strange Adventures of RangerGirl has just hit the top of my to-read pile.